David DelVecchio’s story is like so many others in Springfield. He held on for dear life as the tornado ripped through and then has been forced to deal with the damage the storm left behind. 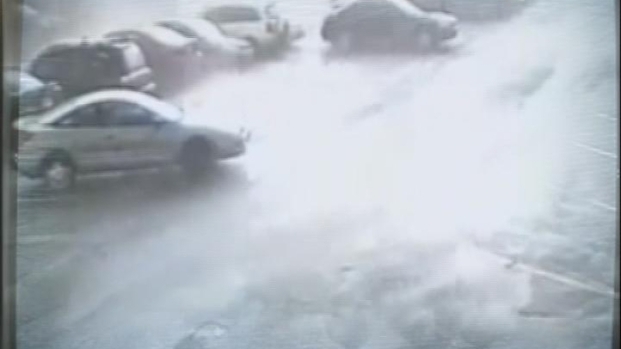 The one major difference is that he has the video showing exactly what he survived as the tornado because his 15-year-old surveillance system caught the tornado ripping through the parking of his Union Street business, Union Car Park. “I ran to my safe. It must weigh a ton. I had one hand on the safe and the other holding the TV and recording system in place,” DelVecchio said. His surveillance system is anything but state of the art. It consists of an old TV/VHS combo and five VHS tapes, of for each weekday, that he has recorded over every week for the last decade. He said he couldn’t bring himself to watch the Wednesday tape until Friday. “I couldn’t do it. It was too scary at first. I saw so many people get hurt. It’s still very raw for me to talk about,” DelVecchio said through his tears. His office became a triage center as the tornado swept through on Wednesday. The victims were his friends who work at the courthouse just across the street. Gauze and latex gloves EMTs left behind still sit on his desk. The aftermath was devastating for DelVecchio. His office had several broken windows, his roof was ripped apart and the garage doors were torn from the hinges. Despite all the damage, he knows he’s one of the lucky ones. All around his office, buildings crumbled and those that didn’t are now marked for demolition anyway. The street was forever changed by that quickly moving storm. “I get emotional when I talk about it. It changed my life as well,” DelVecchio said. We're getting another look at the tornado that swept through Massachusetts. This one as it went through a parking lot.